Optical microscopy is without doubt the most valuable tool in biomedical research, unsurpassed in its affordability, ease of use, ability to study living cells and obtain dynamic visual information. Fluorescent labeling reveals many details about the general structure and composition of cells, but the ~250nm limit in spatial resolution imposed by using conventional wide-field microscopy has prevented researchers from actually seeing many of the structures of interest within cells such as protein complexes and organelles in great detail. 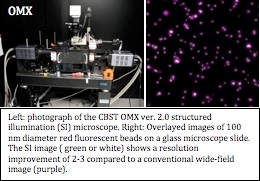 With the help of an NSF Major Research Instrumentation grant, CBST has worked with Applied Precision LLC in Seattle and with UCSF over the past 2-years to assist in the commercialization of this microscope (dubbed OMX ver 2.0; OMX stands for Optical Microscope experimental; ver 1.0 is the UCSF original custom prototype) and has just received the first commercial prototype in its OPRB laboratories (see figure). This microscope is currently operational and is the world’s most powerful wide-field fluorescence imaging platform, capable of resolving intracellular structures with greater detail than previously thought possible with a light microscope. This accomplishes one of CBST’s original goals of helping to make this technology available to the wider biological community. The API OMX v2.0 microscope uses illumination with a periodic intensity pattern that encodes high spatial-frequency information from the sample into multiple lower frequency moiré images. Individual images are obtained at 5 illumination pattern translational positions and 3 angles at each Z-position. These images are then combined computationally to reconstruct the real image at 2 to 3 times the diffraction-limited resolution. The OMX v2.0 provides a wide range of functionalities: rapid pattern generation for structured illumination microscopy; spatial resolution of 100 nm axially and 200 nm vertically; rapid multispectral imaging: 17 frames per second, 3 3D stacks per second or 6 3D stacks at reduced resolution while imaging in 2 channels simultaneously; environmental control enclosure for providing thermal stability, air filtration, and stray light control; and 3 lasers for simultaneous excitation at 3 different colors. 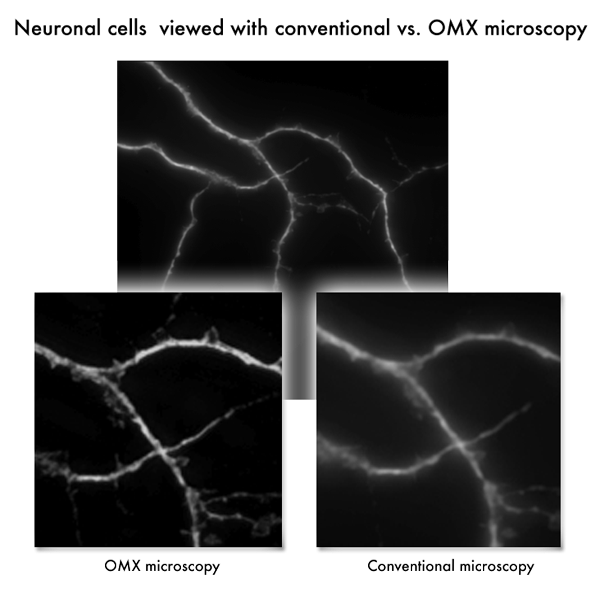 OMX v2.0 uses a DeltaVision deconvolution microscope to survey samples and locate regions of interest to be imaged at high resolution with OMX v2.0 The ultra-stability and the efficient optical design of OMX v2.0 that minimizes the number of optical components permits many uses, e.g. : high sensitivity using single photon counting detectors to enable widefield imaging of single molecules, which can easily be extended to include photo-activatable probes (PALM), FRET and alternating laser excitation FRET imaging (all rapidly, at high resolution, and in 3D). OMX v2.0 was installed at CBST between March 19-21, 2008. Preliminary data on fluorescent beads demonstrate OMX’s capability for resolving fluorescent structures with 100 nm in XY and 200 nm in Z. With post-delivery modifications, the microscope will also be capable of non-linear structured illumination (producing up to 5-10x resolution improvement over diffraction limited imaging) and 4-color video rate imaging that can be used for live cell microscopy. View a movie of the neuronal cells in 3D.